By no means am I the first to notice a remarkable similarity of thinking between Oxford and “Shakespeare” and of the words expressing it. 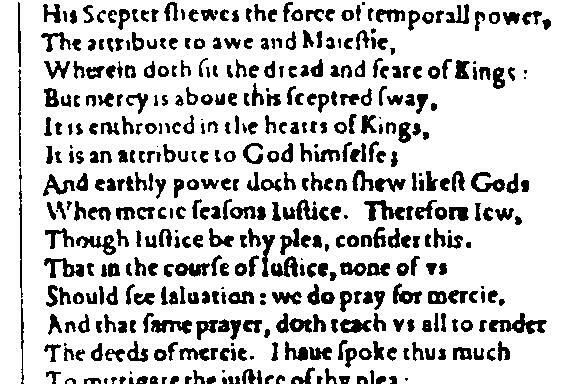 Portia’s statement that when a King combines justice with mercy his “earthly power doth then show likest God’s” is reflected in Oxford’s remark that “nor in anything doth a King more resemble God than in justice” – by which he clearly means a justice that contains the “virtue” of mercy or the capacity for forgiveness. 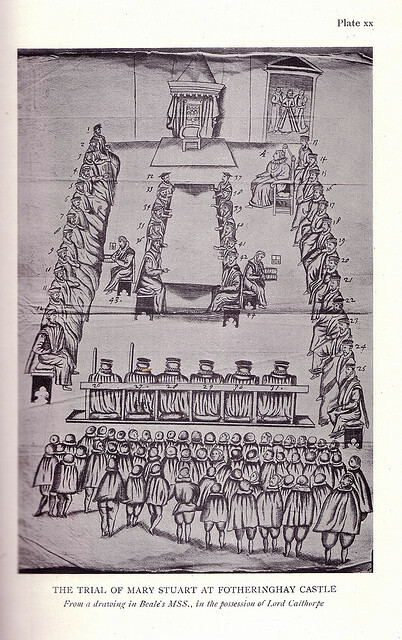 In Chapter 30 of his 2001 dissertation on the “marginalia” of Edward de Vere’s Geneva Bible, which the earl had purchased in 1568-69 before the age of twenty, Roger Stritmatter reports that Oxford had marked a series of verses in Ecclesiasticus on the theme of mercy. The question of mercy “is central to the unfolding action of The Tempest,” Dr. Stritmatter notes. “In this fable Prospero, like Hamlet, learns to abandon the lust to punish his enemies and realizes that ‘the rarer action is in virtue than in vengeance.’ (5.1.27) — in which statement ‘virtue’ is a metaphor for ‘mercy.’ ” He points out that previous students of Shakespeare and the Bible had failed to notice that Prospero’s epilogue “as you from crimes would pardoned be…” derives “direct, unequivocal inspiration” from Ecclesiasticus 28.1-5, which Oxford had marked in his Geneva Bible. I recommend an informative (and amusing) exchange on this subject between William J. Ray and Alan Nelson, author of Monstrous Adversary (2003), the anti-Oxfordian biography of Oxford. 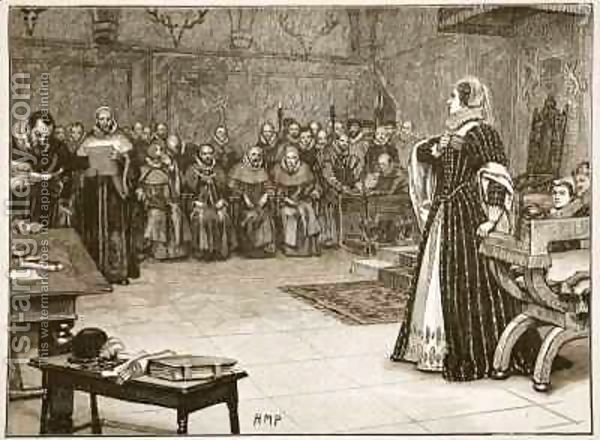 The dialogue was initiated by Ray, who pointed out similarities between Oxford’s “remarkable sentence on the theme of justice” and Portia’s speech on the quality of mercy. 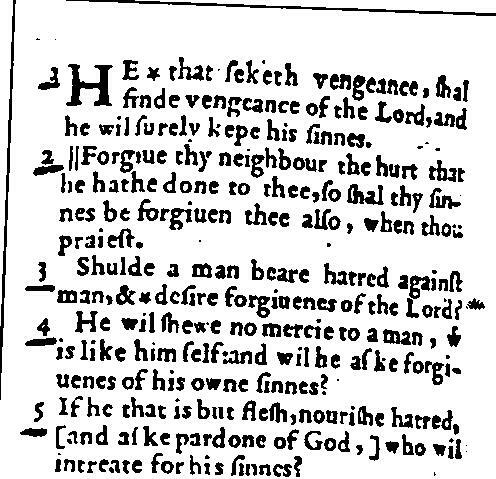 I include Looney’s remarks despite the fact that I share the view of many Oxfordians that Edward de Vere had written the first version of The Merchant of Venice several years prior to the trial of Mary Queen of Scots – that is, in the early 1580’s, four or five years after he had returned (in April 1576) from fifteen months on the Continent with Venice as his home base. Sec. Keep. Say, what art thou, that talk’st of kings and queens? Sec. Keep. Ay, but thou talk’st as if thou wert a king. K. Hen. Why, so I am, in mind; and that’s enough. Sec. Keep. But, if thou be a king, where is thy crown? It is amazing what a guy can learn in taverns. Shakespeare seemed to remember every word Oxford ever said. Another stratum of the ‘Mercy’ subject is that Oxford’s second wife Elizabeth Trentham was a brilliant legal brain, known to advocate the introduction of equity into the fixed rules of English Common Law, whose antecedents traced back to Roman law two millennia old. This was another example of human Biblical justice trying to make inroads into paralyzed Tradition. I assume the author of Merchant of Venice admired her very much, giving her the best lines in the play. At one stretch, the dialogue between Portia and Bassanio said ‘ring’ seventeen times. Pure co-incidence probably, or else there was an echo in the room. Oxford’s Latin initials were ECO. Thanks Hank for making me and old pal Alan Nelson famous. Incidentally, for the record, we exchanged some more sweet nothings at the September 2011 Concordia conference. When I mentioned that John Whitgift, Archbishop of Canterbury, surprisingly sponsored Venus and Adonis, [damn, that Shakspere got around] he blurted from the audience, “That is wrong…I’ll talk to you afterwards, but that is wrong…it would take fifteen minutes to show it…no I don’t have any documentation to prove it…” Funny, W.W. Greg made the claim on page 20 of ‘Licensers for the Press to 1640’. I don’t know why he would do us like that. Great series, maybe send it to the Shakespeare Birthplace Trust just so we can see them look red on video. They can’t have sore noses all the time can they? 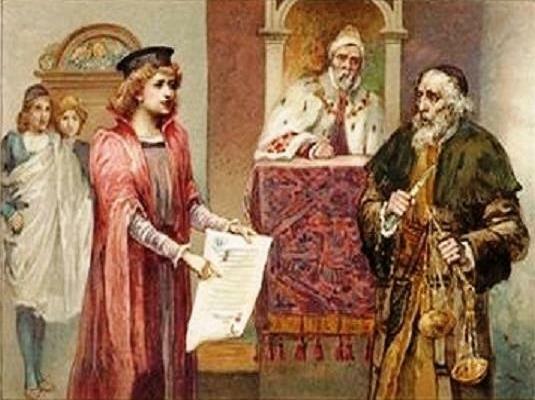 The debate between justice and mercy is an important one in Shakespeare’s work. A strange and little commented-upon scene in RII (5.3) exemplifies: King Bollingbroke has a god-like role as he chooses between justice and mercy in his judgment of Aumerle, whose parents, like bad and good angel, alternately plead for his punishment or pardon. “A god on earth art thou,” exclaims the relieved Duchess of York when the King pardons her son. See my article “Shakespeare’s ‘Figure of an Angel’: An Iconolgraphic Study”. Colby Library Quarterly XVII, 1, March 1981, 6-25. Make my day! Thanks, Allan, and I look forward to reading it! I’ll make sure to comment back to you.